The Easton EC70 SL Stem combines carbon and aluminum for one of the stiffest stems on the market at an exceptionally low weight. Using their TaperWall™ design to create the perfect balance of carbon and alloy, Easton was able to produce a stem that both inspires confidence in sprints yet floats up steep grades with a claimed weight of 140 g for the 100 mm length. It's finished off with an alloy Top-Lock faceplate that ensures correct mating by simply torquing the top two bolts first, and Distributed Stress Technology makes sure the clamping forces are spread evenly over a wider area for maximum strength. Features titanium hardware. ±6° rise. 31.8 mm clamp diameter. Fits 1 1/8” steerers. Claimed weight is 140 g (100 mm). I wanted to reduce the vibration from the front end and switched from my aluminum stem to the EC70. It accomplishes this goal. The top lock instructions could have been better displayed in the included materials. 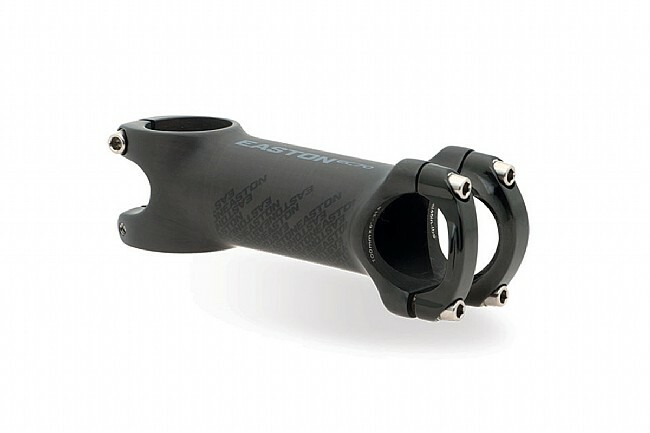 Easton's EC70 stem ticks all the boxes. The stem seems to dampen road vibrations well, and is also nice and stiff where needed for quick handling. It pairs well with the EC90 carbon bars.